Feels like we’ve been here before, doesn’t it? A highly-ranked UND squad comes into the weekend facing off against a lowly non-conference foe that has struggled to score and keep pucks out of their own net. While the result ultimately was good, a 7-4, 3-1 sweep against Lake Superior State in early December, UND fans at the Ralph Engelstad Arena nearly saw a Pairwise disaster before a furious rally in first of two games against the Lakers. And here we are, again. This time, it’s the 59-out-of-59- Pairwise ranked Niagara University Purple Eagles. The No. 3 UND men’s hockey team wraps up its non-conference schedule tonight and Saturday against a Niagara squad that has struggled mightily this season. The Purple Eagles (3-15-2) are last in Atlantic Hockey, in the bottom 10 in the country in scoring (1.95 goals per game) and the bottom five in defense (4.00 goals allowed per game), penalty kill (74.2%) and power play (7.4%). Last week, NU dropped a pair of 4-3 games to Air Force, whom UND needed overtime to beat in November. Continuing the search for scoring, the Purple Eagles rely on upperclassmen forwards Issac Kohls and Hugo Turcotte, who lead the team with 10 (4g, 6a) and nine points (5g, 4a) respectively. Sophomore goaltender Jackson Teichroeb has been the man in the net for Niagara, with all three of the team’s wins. Much like the rhetoric coming into the LSSU series, UND (14-5-2, 7-4-1 NCHC) should have a chance to fill the net against a struggling defensive team. Leading the way for the Green and White, as it has been all season, is the trio of Drake Caggiula, Michael Parks and Mark MacMillan. Caggiula and MacMillan are tied for the team lead in goals with nine. In goal, this could be a weekend Green and White fans see backup Cam Johnson, but with the potential of a devastating loss, Zane McIntyre (14-5-2, 2.01 GAA, .930 sv pct) should see action this weekend. Simply put, this is a must sweep for UND. 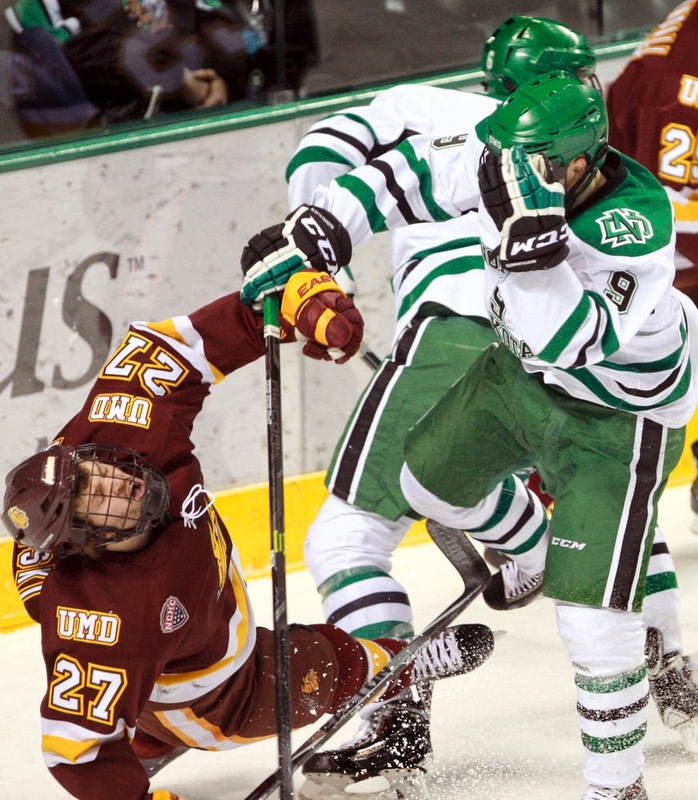 Coming off a hard-fought conference split against UMD, a letdown cannot be in the plan. While two wins won’t help much, a loss would be a Pairwise nightmare. As always, visitors get a boost from playing in the Ralph in front of a rowdy crowd and Niagara has absolutely nothing to lose. DDC expects the Eagles to come out hard tonight and UND has struggled on Fridays going 1-5-1 in their last seven series starters, but if UND can weather the early push, the Green and White roll the weekend. The talent difference is just too large.